14TH CHAMPIONS TROPHY INTER CLUB CHAMPIONSHIP. For Men and Women From 19th to 22nd March 2015. 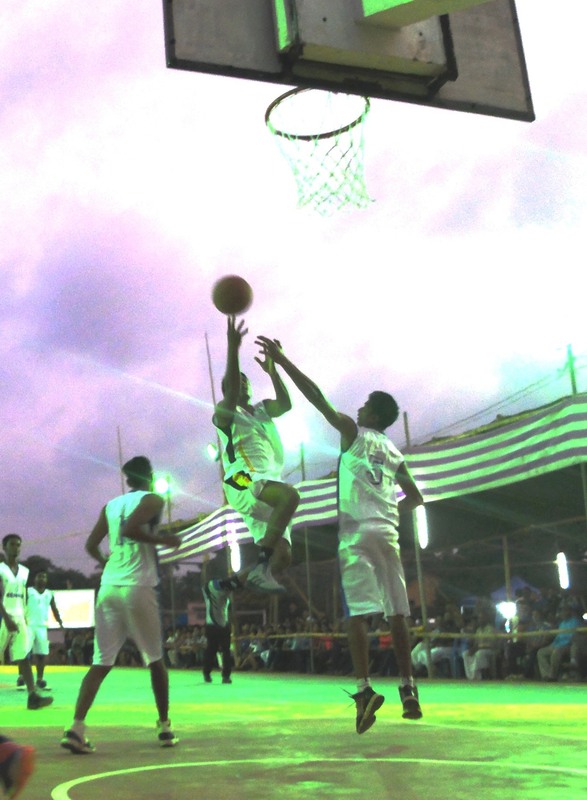 Kerala Police scoring against Nehru Arts and Science College at the 14th Kerala Champions Trophy Inter Club Basketball Trophy. Babykutty, Press Release: Semi finals of the 14th Edition of the Champions Trophy Inter Club Basketball Championship for Men and Women organised by Kasargod District Basketball Association under the auspices of Kerala Basketball Association will be held here at the Rajas High School Nileshwar on Saturday. In both the men and women sections, Kerala Police have confirmed their position in the semi finals. In the men’s division, Kerala Police will take on Kerala State Electricity Board while Customs and Central Excise will meet the winners of Kollam YMCA vs. Sree Kerala Varma College, Thrissur. In the women’s section, Kerala Police will meet the losers of KSEB and Providence College while the winners will meet Assumption College Changancherry in the semi-final. In an exciting quarterfinal match in the men’s division, Kerala Police had to fight till the end to scrape past the local college outfit Nehru Arts and Science College, Kanghgad 68-67 to meet KSEB. For Kerala Police Sreejith N Nair and Jijo Thankachan came out as the top scorers with points 23 each, while for Nehru Arts and Science College, Akshay Asok had 28 pts, Jyotish Babu scored 16 points and Balu Raj had 10 pts. On the opening day, Kerala Police women registered their first victory as they scraped past a fighting Assumption College, Changancherry with the score 71-69 in a Group B match. Earlier, the Championship was officially Inaugurated by Shri Kunhiraman, MLA. In the inaugural match, the experienced Kerala Police, last year’s runners up, after leading 35-26 at the halftime had to fight till the end to beat the Mahatma Gandhi University champions Assumption College, Changancherry. Debonna top scored for the police side with 22 points followed by Surya O PS with 13. For Assumption College, International player Poojamol was the top scorer with 29 points followed by Aiswarya with 15 points.